A rainbow forms after the RS-25 rocket engine test firing on August 18, 2016 at NASA Stennis Space Center. 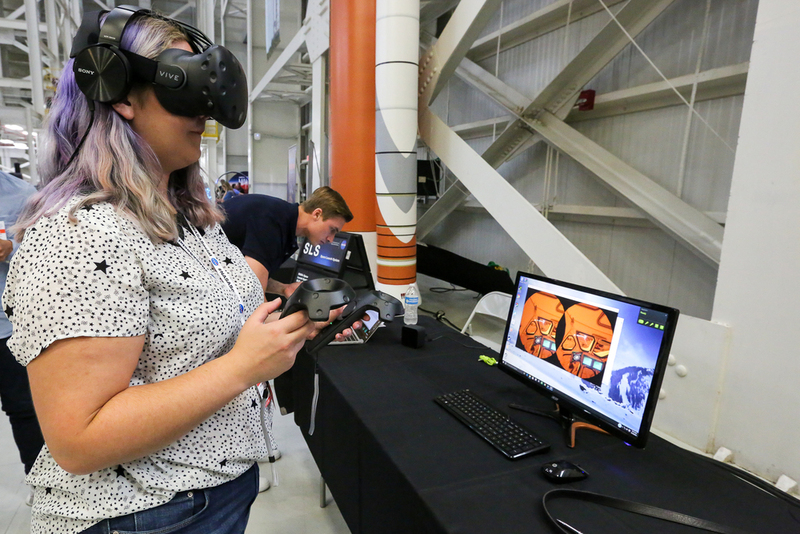 This week I attended the NASA Social event at NASA Michoud and NASA Stennis, to get a behind-the-scenes look at our human journey to Mars planned for the 2030's. The NASA social media team puts on the NASA Social events (formerly NASA Tweetups) to invite members of the public (i.e. me) to learn about their latest missions, technology and hardware. 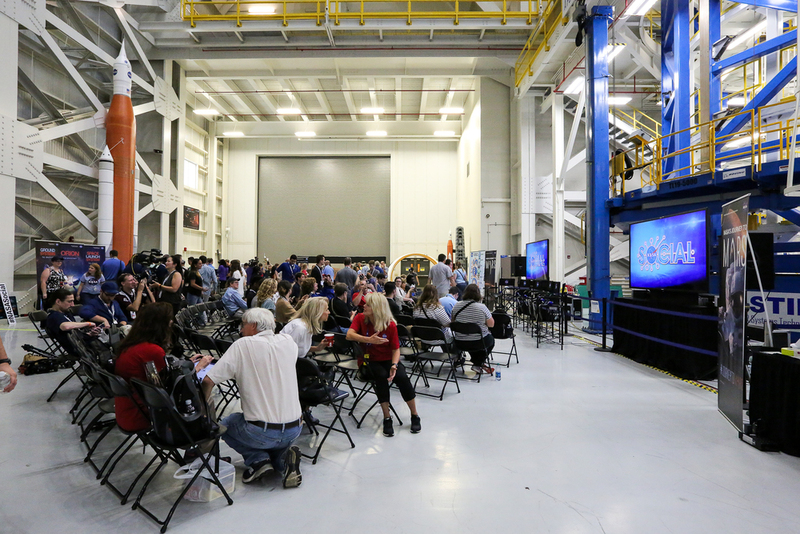 At this event, we learned all about how NASA is preparing for more missions to Mars, including a crewed mission, and what it will take to get humans there. Inside NASA Michoud for NASA Mars Day. 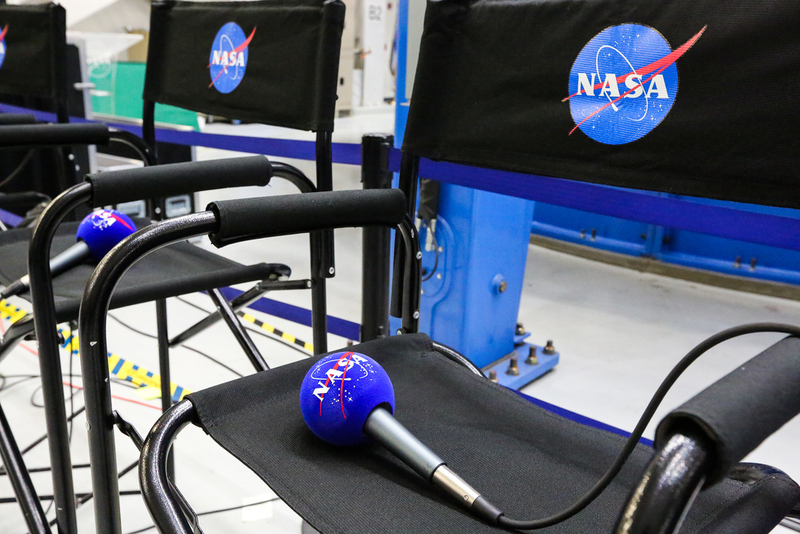 "It's a great time to be here at NASA, working in aerospace," said NASA astronaut Rick Mastracchio during the NASA Mars Day live TV event. "It's a great time to be an engineering student, because we have so much work to do. And it's a team effort. As an astronaut, we get to ride on these rockets, we get to fly on these missions, but it's really a team effort. It takes so many folks to do these missions." 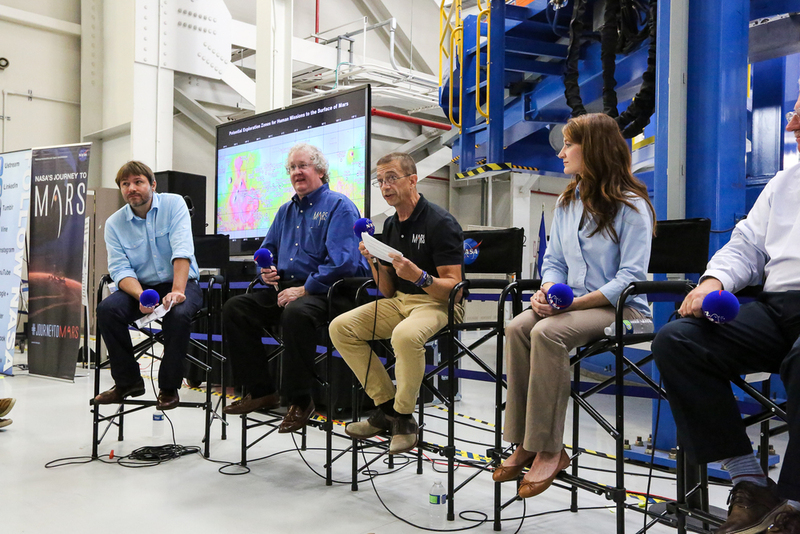 During the NASA Mars Day event, Mastracchio and others talked about the challenges of getting to Mars and how it will take teamwork and new ideas from perhaps unlikely places. 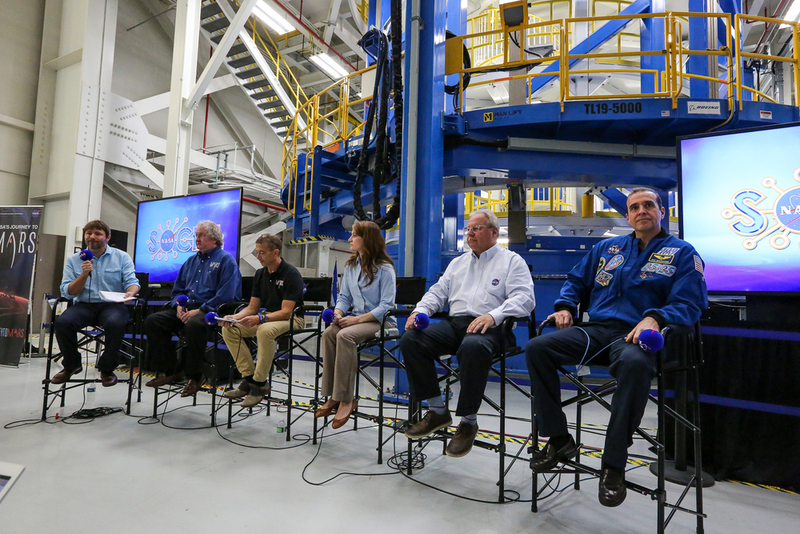 "A lot of people ask, 'what happens if you get hurt on [International] Space Station?'" Mastracchio said. "Well I was trained as a doctor, a dentist, an ultrasound technician. We are all trained to treat each other in case something goes wrong. We had a full set of pharmaceuticals and medical devices to take care of each other. We are going to have to have those kinds of things on these long duration missions [to the moon and Mars], but we are going to have to be much more efficient in it. We can't carry a thousand pounds of medical gear. We are going to have to be smarter about it - what do we really need when we are out beyond lunar orbit?" Mastracchio talked about the challenges of flying into deep space for the journey to Mars. NASA has plans to send humans to Mars in the 2030's, but there are many obstacles to surmount in getting humans to Mars and back quickly, safely and cost-effectively. But as much as NASA faces challenges in preparing to send humans to Mars, it's become a given among members of the US public today that NASA will send humans to Mars sooner than later. "I was at a community college giving a talk a year ago, and do you know what was fascinating to me?" Rick Davis, assistant director for Science and Exploration at the Planetary Science division at NASA, said during an interview at NASA Mars Day. Davis works on Mars exploration policy. "I work at NASA Headquarters in Washington DC worrying about funding and logistics. But all of the people at that lecture, mostly entry-level college students, just accepted that [we are going to Mars] as a part of their reality! There's a movie coming out soon about a kid who is born on Mars. Technically it's a little off, but I loved that they painted a picture of what being a real martian would be like, thinking about life on Earth." Martian Simulation. This realistic simulation game using Mars imagery and tomography will be used to train astronauts for Mars: http://mars2030-vr.com. Davis said that going to Mars will require us to think differently and think outside of the box, and that young people can help with this. "A lot of times we are victims of our own paradigms," Davis said. "There is a mantra that in space is dangerous, on the surface is safe. What's incredible to me working on Mars stuff now is that a lot of people will take that mantra, even my comrades, and move it right to Mars. The reality is that in space is safe at Mars, while on the surface of Mars with our current understanding is dangerous. You have soils that are toxic. On a warm day it gets up to freezing, and overnight it drops 120 degrees. You've got these really funky things that are going on. The point is that you have to be careful that you don't apply old paradigms." Davis has been co-leading a study to identify potential human landing sites on Mars. He says he has been fortunate that this effort has been open to scientists and to the public and broadcast on social media. "You get some fringe ideas coming in, but you know what, you have to be careful about dismissing fringe ideas, because you actually may miss something that is totally enabling," Davis said. "Openness is really good for making this happen. [...] I'll be blunt, I was born in 1960. I think you get caught in your thinking patterns, and I think you need people at all age levels thinking about this, because everyone is bringing a different perspective." Davis also talked about the search for life on Mars, preventing humans from contaminating Mars and thus making it more difficult to find any martian microbes, and preventing backward contamination of any Mars microbes that might come back to Earth. 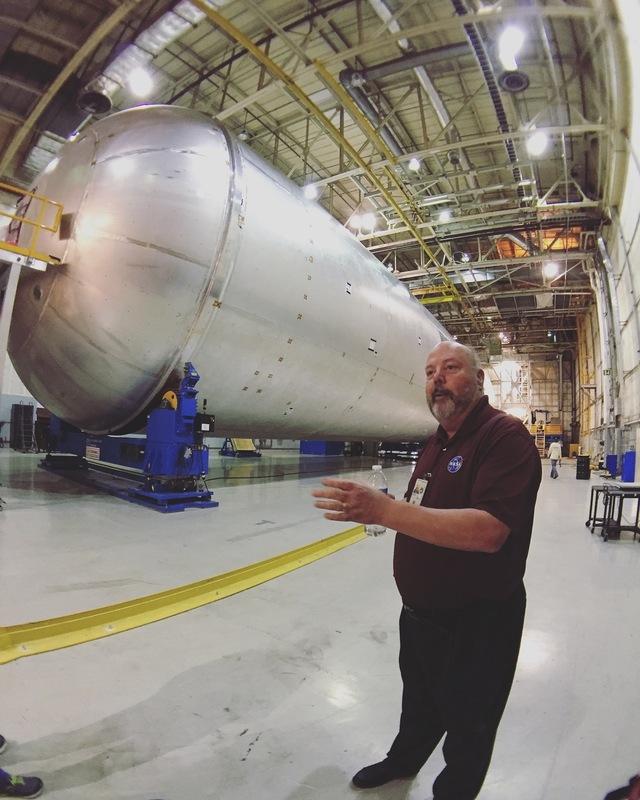 At the NASA Mars Day at the Michoud Assembly Facility, we saw many pieces and parts of projects and machinery that may go to Mars during both uncrewed and crewed missions. Some of most important projects for the journey to Mars focus on robotics and other technology for mission autonomy (because missions can't be reliant on ground crews on Earth), and more efficient utilization of resources like water and oxygen. The spacecraft that will take humans into deep space, and eventually to Mars, is already being built. The first phase of this is building the piece that will get humans into and out of Earth's atmosphere on the way to Mars - the Orion spacecraft. Once the SLS and Orion have been built and tested, habitable units will be built for Orion to dock to, to allow humans to live in deep-space for the length of time it will require to get to Mars and back. Then, NASA will start designing and building the Mars lander, to actually get humans onto the ground of Mars. However, it's likely that the first crewed mission to Mars will keep humans in orbit around the planet vs. getting boots on the ground. Celia Blum, who works for Lockheed Martin, is the structural lead on the Orion spacecraft. Blum works with people at many different NASA-affiliated centers to ensure the structure of the Orion spacecraft fits the parachute system, rocket launching system and other systems being developed to interact with the Orion crew module. When she first started her job, Blum said she needed a cheat sheet just to know all the abbreviations and jargon being used by other teams in meetings. It was like trying to figure out the abbreviations her kids use when texting her, she said. She regularly meets with other NASA folks all over the world via Skype calls, to make sure Orion does everything it needs to do. Some of the hardware pieces that will form Orion, the crew module that will go on top of SLS and be launched into deep space and to Mars. Image Credit: Paige Jarreau. But the star of the show at NASA Michoud was definitely the rocket system that will propel us through deep space to Mars. We saw the in-progress making of the SLS (Space Launch System), the most powerful rocket in the world. We saw the vertical assembly center (pictured below), a huge piece of machinery being used to put together the SLS components, including a massive liquid hydrogen tank, using friction stir welding. This is a welding technique that uses friction instead of heat to put together spacecraft parts with fewer defects and potential points of failure. 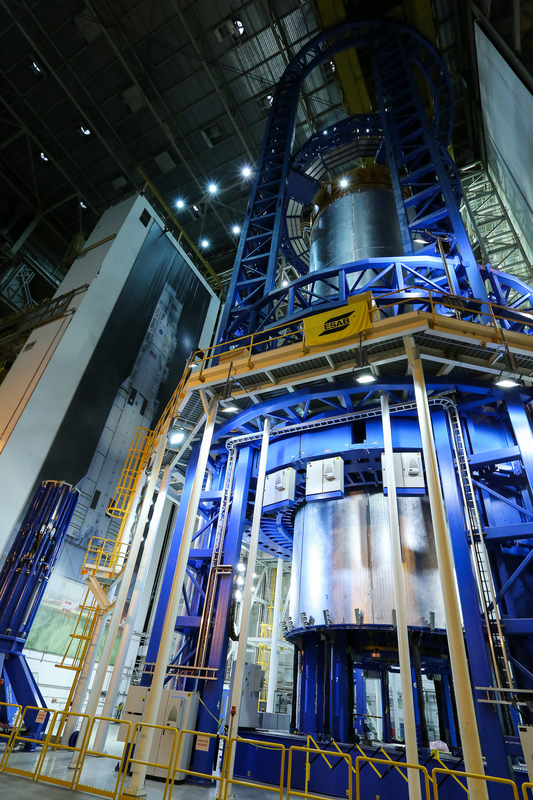 The vertical assembly center at NASA Michoud is being used to build the Space Launch System (SLS), our generation's version of the rocket system that launched Apollo 11 to the moon. The SLS (space launch system) being assembled at NASA Michoud right now will be the most powerful rocket we have ever built. It will launch human space vessels into deep space and eventually it will send humans to Mars. "SLS plays a huge part in enabling the journey to Mars." - John Honeycutt, SLS program manager. As a part of NASA Mars Day, NASA tested one of its 16 RS-25 engines. The SLS will use 4 RS-25 engines and 2 rocket boosters to send its payload, the Orion spacecraft, around the moon and then to Mars. The RS-25 is a revamped version of the engines that sent Apollo to the moon. These revamped engines are going to send Orion into deep space, and eventually to Mars, as part of the new Space Launch System (SLS). An RS-25 rocket puts out half a million pounds of thrust, generating 10x the equivalent thrust-to-weight power density of the largest commercial jet engine. Watch 4 minutes of rumbling and roaring of an RS-25 rocket engine below! The entire test lasted approximately 8 minutes. You could feel it even more than you could hear it. Entering NASA Michoud Assembly Facility for NASA Mars Day. 43 acres under one roof. Visitors wait for a panel of NASA experts to talk about our journey to Mars, how we are going to get there and what it will take. John Yembrick, NASA social media, runs a panel for NASA Mars Day. For Mars missions we won't be able to have real-time conversations with the ground. We will have data dumps. We will have to change the way we communicate. Rick Davis, planetary science at NASA, says going into space may be becoming so integral to our culture that we don't think about it as a big deal. Orion is the spacecraft that will take humans beyond the moon and to Mars in the 2030s. Orion will be tested in 2018 in an uncrewed orbit around the moon. The vertical assembly center is being used to create the components of SLS, to be the most powerful rocket in the world. This is where components of SLS are assembled using friction stir welding, a new technology. 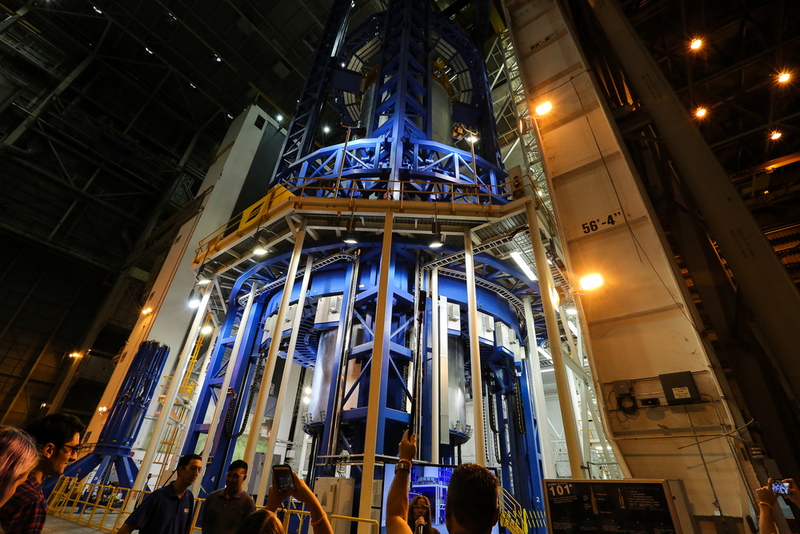 A NASA Social participant stands in front of the vertical assembly center. A graphic of SLS, the most powerful rocket in the world that will send humans to Mars. Celia Blum is the structural lead on Orion, a new spacecraft that will take humans deeper into space than they have ever been. A model of what a habitable unit for Orion might look like. This unit would orbit Mars and house a human crew. An RS-25 rocket puts out half a million pounds of thrust, generating 10x the equivalent thrust-to-weight power density of the largest commercial jet engine.